women innovators & influencers who know better. We connect founders & funders, champion women in entrepreneurship & tech by advocating for diversity on boards, as speakers and in leadership positions, as well as speak up for pay parity. 35 women speakers, hundreds of new connections and plenty of prosecco. Subsequent sold-out events featured the likes of Australian keynote speaker & global phenomenon, Taryn Brumfitt, at the Waterfront Theatre in collaboration with RAW Beauty Talks. Stronger together, we also believe in supporting great women in the community. 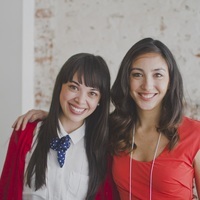 We're proud sponsors of BC's TEDxWomen and the TechWomenLead initiative among others. Rachel Sklar - a former lawyer who writes about media, politics, culture and tech - became the poster-woman for gender equality when she created the hashtag #changetheratio. The effort was in response to a 2010 New York magazine story about tech entrepreneurs that featured mostly men. The truth is: belonging starts with self-acceptance. Your level of belonging, in fact, can never be greater than your level of self-acceptance, because believing you're enough is what gives you the courage to be authentic, vulnerable and imperfect. "Thanks again for a wonderful session of love, light & laughter at The Collective. I feel I've been operating at a whole new level since I began to #LeanIn and it's wonderful." "I was truly inspired by the events and the amazing people who attended!" "I love the progressive and forward thinking approach you are bringing to having these conversations and gatherings in our beautiful city." "I wanted to say how much I really enjoyed The Collective. It was so inspiring and have already made some changes in my life... Looking forward to the next event." "Congratulations on putting together a fantastic Conference and bringing together a really dynamic group of women. .. I was also able to reconnect with some of the women I've been 'climbing the entrepreneurial ladder' with over the past years and met great new people." "It was such a fun time and very energizing. You are wonderful - thank you for helping us all shine just a little bit more!" Our inaugural Founders Collective conference that started it all. Tera Kristen, Laura Fraser, Sarah McCredie and Meredith Cale. Meredith is a serial entrepreneur, rule breaker, connector & creative. Prior to launching Shopthefloor.com, Meredith bootstrapped three companies in the fashion industry, opening showrooms across the US & Canada, and generating over $45m. Her companies partnered with global brands including H&M, Saks Fifth Avenue, Urban Outfitters & Amazon, dressed the likes of SJP & Julia Roberts, and were featured in NY Times, Vice & Vogue. Today, Meredith is a venture capital investor with Voyager Capital and pays it forward as a mentor to countless founders, Board member at Greater Vancouver Board of Trade & Metabridge, and co-founder of a national startup educational program and incubator for youth (est 2013). Some of our favorite sources of education, inspiration and - of course - laughter. Google's Executive Chairman Eric Schmidt moderates a fascinating hour-long conversation with Sandberg about women, leadership and more. This video is part of the Museum's acclaimed "Revolutionaries" speaker series, featuring renowned innovators, business and technology leaders, and authors. Discussions revolve around the process of innovation, its risks and rewards, and failure that led to ultimate success. Brené Brown studies human connection -- our ability to empathize, belong, love. In a poignant, funny talk, she shares a deep insight from her research, one that sent her on a personal quest to know herself as well as to understand humanity. Brené Brown studies vulnerability, courage, authenticity, and shame. Her follow-up TEDx talk is here and it's as beautiful and honest as anything we've ever heard. The amazing Tina Fey recently sat down for the season premiere of Inside the Actor’s Studio with James Lipton and shared some insights into how working women should behave. Also, watch Tina Fey's Mark Twain Prize Acceptance Speech at left. If you've yet to pick up Tina's book "Bossy Pants", read it now, thank us later. How does it feel to be the CEO of a start-up? Quora is a collection of questions and answers that is created, edited, and organized by everyone who uses it. Quora's our first stop when we have a professional query. It contains all kinds of high-value content from industry insiders. This post is by our good friend, Paul DeJoe, CEO of Ecquire. It also happens to be one of the most read Quora posts of all time. Rita Pierson, a teacher for 40 years, once heard a colleague say, "They don't pay me to like the kids." Her response: "Kids don't learn from people they don’t like.’” This talk is a rousing call to educators to believe in their students & to connect with them on a real, human, personal level. Good is an online community of people who give a damn. It's also where people share what's good to learn and do. GOOD is a super cool global resource of, by, and for pragmatic idealists working towards individual and collective progress. A question well answered (that stands the test of time). Q: Everybody is telling us to raise smart money. What’s the difference between smart money and dumb money? Drawing from some of the most pivotal points in his life, Steve Jobs, CEO and co-founder of Apple Computer and of Pixar Animation Studios, urged graduates to pursue their dreams and see the opportunities in life's setbacks -- including death itself -- at the university's 114th Commencement. Find a full written transcript of the address here. Elizabeth Gilbert muses on the impossible things we expect from artists and geniuses -- and shares the radical idea that, instead of the rare person "being" a genius, all of us "have" a genius. The author of 'Eat, Pray, Love,' Elizabeth Gilbert has thought long and hard about some large topics. Her latest fascination: genius, and how we ruin it. Empowering people everywhere to create the change they want to see. There are more than 80M Change.org users in 196 countries & every day people use it to transform their communities – locally, nationally & globally. Whether it's a mother fighting bullying in her daughter's school, customers pressing banks to drop unfair fees, or citizens holding corrupt officials to account, thousands of campaigns started by people like you have won on Change.org – and more are winning every week.